So, Jack, how do you charge your nickel cadmium batteries? Basically the manual says to charge them at 35 amps until they reach threshold voltage which is about 8 volts per battery. After that charge them (an overcharge) at 7 amps for the same amount of time you charged them at 35. I was thinking one of those old Lesters might be able to hit them with 25 or 30 amps. Lynne:I don't understand the purpose of the overcharge. I thought overcharge was supposed to be a bad thing. Every type of battery has its own charge profile. You don't want to overcharge lithium or sealed batteries; they do not have extra electrolyte to boil off. Nor can eletrolyte be added. That's why you need a BMS for sealed and lithium batteries. Lead acid need occasional overcharging to equalize the different battery voltages; you compensate for water loss by adding more. For the Saft nicads, (according to the manual) the last part of the charge is an overcharge only it is suppose to happen every time. Its part of their charge profile or design. Water can be added later if necessary. This is an important point from the manual: You only want to add water to nicads in the 15 minutes after a full charge. Well anyway, as you might imagine I didn't have a 35 amp charger so I've been using my Russco which charges at about 10-12 amps. Comment from Bill Brinsmead: I tried changing out the KOH electrolyte once, actually. You have to use a LOT of KOH pellets, and it doesn't work very well anyway. Oh, and by the way, I use the 12 amp charger for mine, too, a Manzanita Micro PFC-20. The Russco is for lead acid batteries, right? What's different about the charging algorithm? 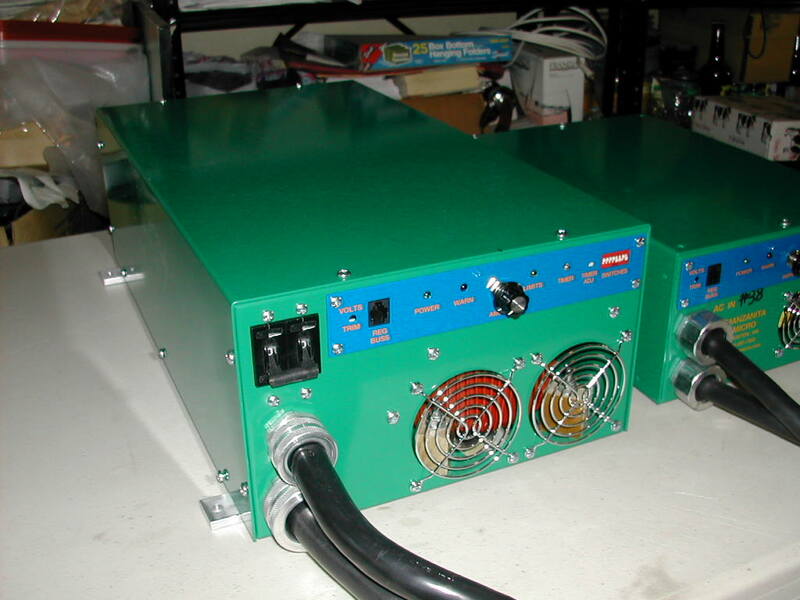 Jack: The Russco is designed with lead acid batteries in mind, a lead acid charge profile, or algorithm, if you will. But many use it to charge other batteries too. This is confusing, but as I understand it, the Rusco provides current and voltage and you can put that charge anywhere that will accept it and the Saft batteries accept it. The Rusco has a dial to set the finishing voltage. I have 13 batteries so the finishing voltage I want is 13 X 8 or 104 volts. After the charger reaches that voltage it stays there for half an hour and then shuts off. I've set it a bit lower actually, so I don't get the bubbling and leaks. Some Russco's don't have a timer and if the max voltage was set too high and you had leaks you would have a real mess. As a backup safety I keep my Russco on a timer. I know if I drive 10 miles it will take about 3 hours to recharge so I set the timer for 3 hours. In the morning I'll check the voltage and maybe charge for another hour or so. Comment from Bill Brinsmead: I never do the overcharge. I charge mine at 11-15 amps to the cutoff voltage (80% full) and stop. That way they don't boil over and I never have to water them. It works fine. My Saft batteries, the STM-180's, had 65k miles on them when I got them and I've put another 35k miles on them since. Also? Don't leave your charger connected while you drive with your Ni-cads. I've blown up two chargers that way, or blown fuses in them that needed to be replaced. Rich Rudman (the maker of the Manzanita Micro) has been very kind about it, but I won't be doing it again. Comment from James Weirick: A $5 rectifier the size of your thumb starts at 40 amps and goes to a trickle of 2 amps on a 120v system. I do not know why it is called a bad boy charger because it works good and cheap on my STM-180's. From the Saft manual at the EVDL: "Increased concentrations of potassium carbonate in the electrolyte will lower discharge voltages, increase charge voltages, decrease charge acceptance and reduce life (4-11)." How do you get increased concentrations of potassium carbonate in the electrolyte? Air from leaky hoses. Yep, plain old air getting into the batteries is full of carbon dioxide. Let that carbon dioxide hang around socializing with the KOH electrolyte solution, falling in love and exchanging electrons and whatnot and before you know it? BAM! you've got 'increased concentrations of potassium carbonate in the electrolyte'. Just like prom night. Jack: The biggest problem I've had is with the hose leaks. The ni-cads have a hose system which drains excess hydrogen and oxygen from the batteries during charging and provides a path to fill them every once in a while when the water gets low. I had a heck of a time getting the hoses hooked up so they don't leak and I'm still not quite there. Saft apparently has parts but I've never been able to get them on the phone (or email) so I have had to jury rig hose connections. Actually, it works pretty well using the white pvc connector pieces and clear tubing of the right size. I also use the universal plumbing cement. After I got the leaks from the hoses fixed I still had leaks when threshold voltage was approached. Water came out around the terminals. The washers under the terminals were old. I found substitute washers (garden hose washers) and installed them. The jury is still out, but so far, so good. The batteries also leaked around the O rings which sealed each orange cell valve apparatus. You can twist these orange valves to take them out and expose the o ring which I did, trying very carefully not to get any dirt in the battery. I replaced the o ring on the leaky valves. For the last year I have been using the batteries and they seem to be about the same now as they were a year ago even though I haven't been able to give them a real overcharge like they are suppose to have. Hopefully, I'll have all the leaks fixed soon and then we'll see. The batteries don't leak until you get to the threshold voltage. I've been staying under that. If you get leaks you will get a little water, or whatever it is, on the tops of the batteries and this will cause a slight voltage leak, enough to throw the GFI on the Russco. You need to fix the leaks or keep under the threshold voltage.